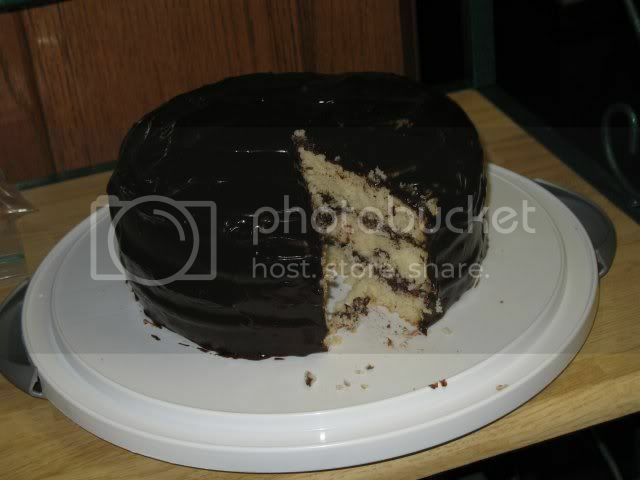 I have been trying to find a good (from scratch) yellow cake recipe that’s moist, tender and has good flavor. After months of searching, testing and tinkering I’ve finally found what I was looking for. This is a combination of two recipes; one was a pound cake and the other was a yellow cake. All of the yellow cakes that I had tried were the fat and sugar cream method and it was just not giving me what I wanted in a cake. Then I came across a pound cake recipe that dumped everything in a bowl and beat it up. It turned out moist and tender but heavier of course than a yellow cake. So I decided to try combining the two recipes and hit the nail on the head the second try. I’ve made three more since just to be sure it would come out the same each time and it does. The crumb looks really great. When I've tried doing a scratch yellow cake in the past it always tasted so....pasty-like raw flour. The butter and milk must add good flavor to this recipe. I need a good yellow cake recipe to add to my collection. The oil amount in the above recipe turns out to be 1 tbsp. plus 1 tsp.or 1 1/3 tbsp-if you want to put an amount down. To get a really yellow colour use eggs from hens fed on maize. That cake looks delicious Betty - made my mouth water! mouth watering cake from scratch! It was grandma bridgie's (my husband's grandmother), passed down to one of her daughters (aunt mary). The name became 'aunt mary's cake' for decades and she passed it onto me when she could no longer cook...no one else in the family has it b/c they don't bake. I'll always call it one of the two above names, it is not my cake I was just priviliged to be the recipient of the the family recipe (which btw is probably similar to some old time cake recipes). Our cake is clearly more yellow than yours though. If mixed by hand it has a slightly heavier almost cornbread crumb. With mixer it becomes a smoother crumb. Our family likes it by hand. I would love to have the recipe if you wouldn't mind sharing. I have a pound cake recipe that I wheedled out of a lady who owned a catering business...she was serving at a party I had been invited to many years ago and it is to die for and really easy to make. I also have an over 100-year-old pecan cake recipe that is cooked in a cast iron skillet. I'll share if you share...teehee!! Thanks. This cake looks delicious and I have two birthday parties coming up. What is your favorite chocolate icing recipe? This is our favorite chocolate frosting...it also is a very old recipe. This is the frosting that is on the cake in the picture. 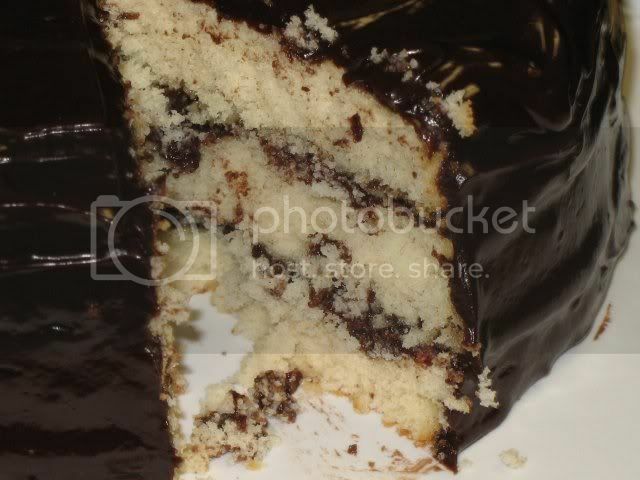 I make 1&1/2 recipes to frost a 3 layer cake with, one recipe isn't enough. One recipe is good for a 9x13 inch pan. Add 1/2 stick of butter and 2 teaspoons vanilla. Is your all purpose flour bleached or unbleached? Our Canadian unbleached is quite strong in protein level, good enough for most breads. I'm tempted to say your AP must be bleached, as cake flour usually is. But would love to know for sure. I'm not sure but I would think that King Arthur doesn't sell bleached flour. They do sell cake flour, though. I have ordered bread flour, wheat flour, and high gluten flour from them as well as other speciality items like powdered buttermilk and been very satisfied. If you have a store like Whole Foods or Henry's you may be able to get cake flour out of a bin by weight. Thanks but I have access to all kinds of flour. Was just curious as to what sort of AP Betty was using to get that lovely texture. Appreciate your impulse to help, though. I live in the Southern US and our all purpose flour is very low in protein about 6 to 8% and is used mostly for biscuits, cakes, cookies and the like. It's not the same thing as cake flour as cake flour here in the US has been treated with clorine to further break down the strength of the gluten. If we want flour to make bread we either add vital wheat gluten (which is sold in almost every grocery store) to our AP flour or buy bread flour. I personally mill my own whole wheat flour for making bread. That's cool and so interesting! No wonder you Southerners are famous for your biscuits! And cakes! I could use bleached AP then, but I think I'd opt for cake flour making your recipe. At least, I'll try that first. As I mentioned below to the other poster, the texture looks lovely. Congrats on your successful experiment. I had been looking for wheat starch for some time. I could order it in bulk from my local health-food store, but I would have to buy 5 lbs. minimum. Then, my wife found it in a Middle Eastern grocery. The maker (distributer, actually) sells it online for $1.39 per 12 oz. That way, I can add it to my California AP flour and make a good biscuit dough. I don't know how high in protein your AP flour is but I think I would try mixing the two half and half. I don't think I would use all cake flour. This cake needs a little tiny bit of gluten development to hold it together or it would just fall apart. Canadian AP can be used gram for gram, ounce for ounce in place of bread flour. Both are around 13% protein content (bread and AP whether bleached or unbleached but unbleached best for bread). I don't use this particular brand of cake flour, but our cake flour would also seems to be equal to or higher in protein than your AP - somewhere between 6 and 10%. Made with soft wheat, of course. If your cake flour is that high in protein then you are right and should just use the cake flour...I think it would work just fine. So sorry for the delay in posting this recipe, hopefully you'll find it worth the wait. Please leave feedback on my blog once you've tried it. I was reading the recipe and noticed that it doesn't call for eggs. I have never seen a cake recipe with no eggs. Does it hold together alright without them? Always place a foil covered sheet pan under the Bunt pan as this cake sometimes will overflow it's pan. The crunchy little "cookies" that form from the overflow are a special treat for the cook. Allow to cool in pan until luke warm. Once removed from the pan, I let it sit on a wire rack and cover the whole thing with a heavy towel, till the next day ... This allows the "crunch" to form. If you flip it onto a plate or serving platter right away, the part that *was* the top (open end of pan) can get soggy. The pan I prefer to use most often (for a Bundt)is an old Nordic Ware 14 cup capacity, very big & VERY heavy. It was my Grandmothers, I don't know they make it anymore. This cake also fits perfectly in a 1/2 sheet pan. As far as the texture ... The best way I can describe it is "velvety" and rich. The top (open end of pan) gets the most delicious crispy little "crunch". I will definintely try these recipes. My dad loves pecan pie but as he has gotten older he has been saying it's too sweet and too nutty....yet he still requests it. I bet he WILL LOVE the pecan cake I will definitely bake it and let you know! Also my mom always used to make the (box kind of) pound cake mix...she always said it was a healthy dessert b/c it was fairly low in fat. I can't wait to try from scratch. What altitude does this cake work at?